It caught everybody by surprise: the snow. Even the birds were caught off guard on April 1st. And they always know—the Canada geese. When you hear their first honk-honk in late winter, even with snow on the ground, and never mind what the groundhog had to say, it means one thing: spring is on its way. I encountered this pair of geese a few days ago, and followed them down a little path, wondering whether I was wasting my time. 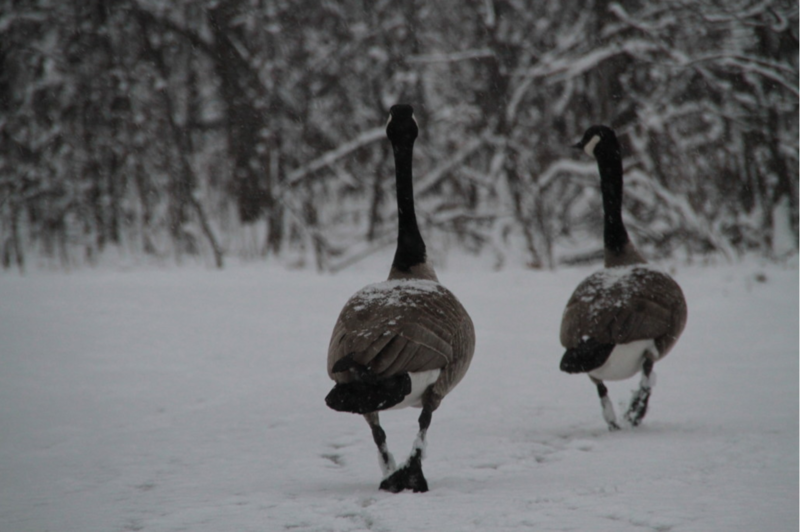 For the past eighteen winters, living in Winnipeg, I have seen the geese getting it right, for the most part. They don’t need the weather bureau. I have little difficulty believing the weather channel actually studies the skies every morning and once they spot the first returning geese, announces warmer weather. Four days ago, the birds got it wrong. (They probably didn’t get the memo.) The snow was already all gone, save for in the cool shady spots. Then, early Friday evening, it started snowing. I grabbed my camera and drove to the nearby forest, to the side of our neighborhood, hoping to capture something worthwhile. I pursued the birds while it continued snowing. 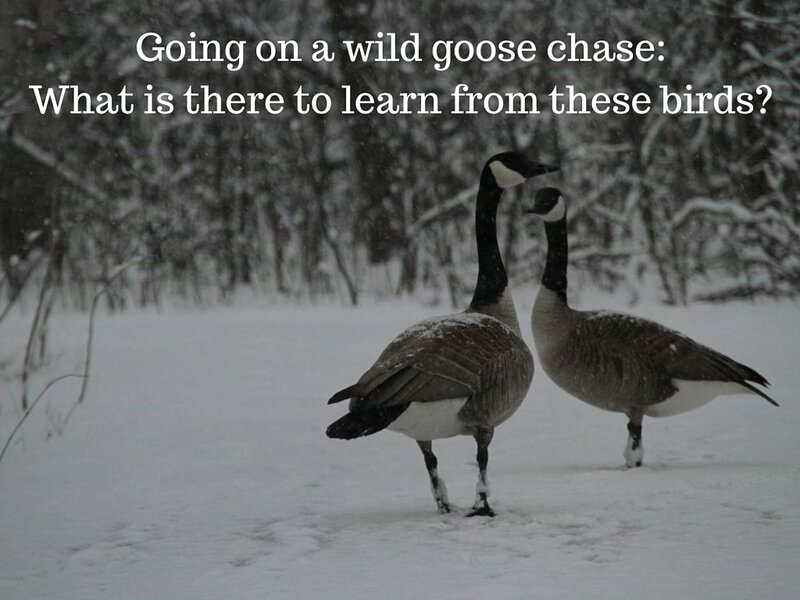 We know going on a wild goose chase implies being on a hopeless quest, to busy oneself with a fruitless endeavor. Because: time is money and in short supply. Don’t panic, be realistic. If you can “create” 30 minutes each day after a month of practicing–it’s a big deal, you’ve made progress! 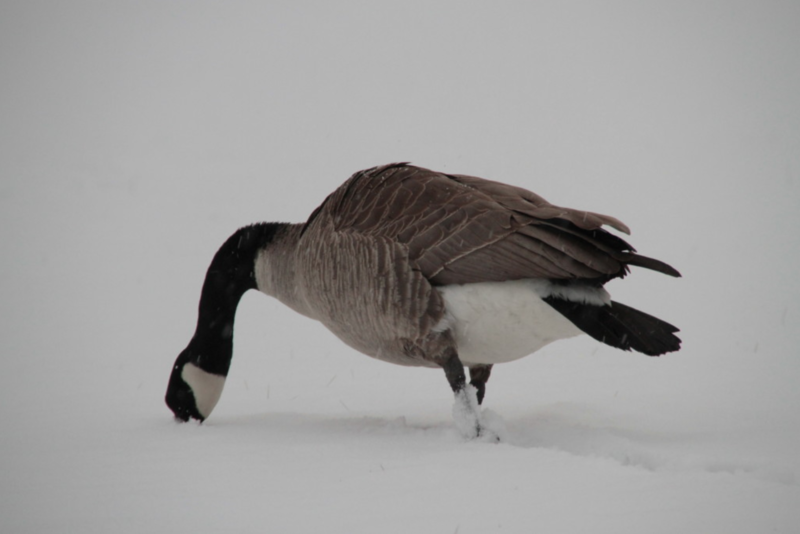 I pulled my cap lower to keep the drifting snow out of my eyes and tried to shoo the two geese. They refused to waddle any faster. 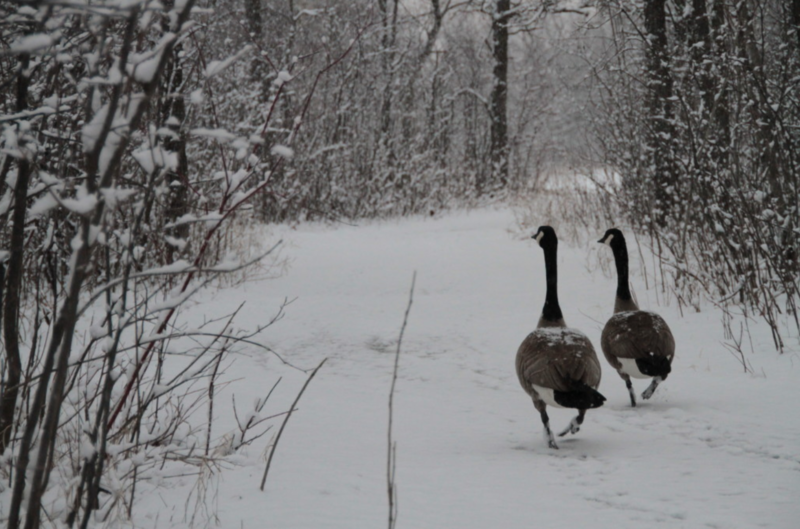 Once we reached the clearing I wanted to spook them so they would take flight, enabling me to get better pictures. They had a different take on things. 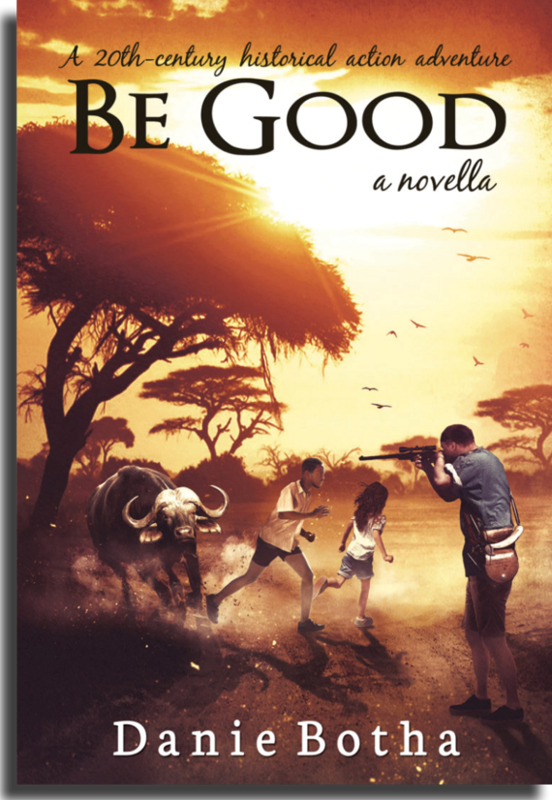 They stuck together, unruffled, the fresh powder clinging to their backs and legs, in spite. 1. Loyalty is what friends do. The birds stuck together, no matter what. For better of for worse. According to researchers, goose pairs remain faithfully united until death, or until circumstances outside their control intervene and separate them. Like dogs, geese demonstrate human feelings: they will quite literally hang their heads, lose appetite and become indifferent due to stimuli from their environment. What does our relationship (any and all of the above) cost us? Is it one of convenience, a one-way street, with us only on the receiving end? Is there any growth in the relationship? Is it maturing? Stagnation is a dangerous place to be. Things fade, things shrivel, things die. Regular interaction is essential. To nurture a relationship requires time, effort and being honest. It often requires being vulnerable. Spice it up. Be original. Be surprising. It’s about giving. You receive, but you have to give first, without holding back. If you’re loyal, you will help the other grow. You will enable them, empower them. It’s not meant to be 50:50, with both holding back, but 100:100, both going full out. It was not the first time I had pursued geese on foot, armed with a camera. Often they will take flight if you come too close. These two were more bothered by the white flakes than by me stepping closer, clicking away. They didn’t even blow at me as they always do when their goslings are around. They stoically watched me, and only when I could almost touch them, did they turn around and shuffled down the path. 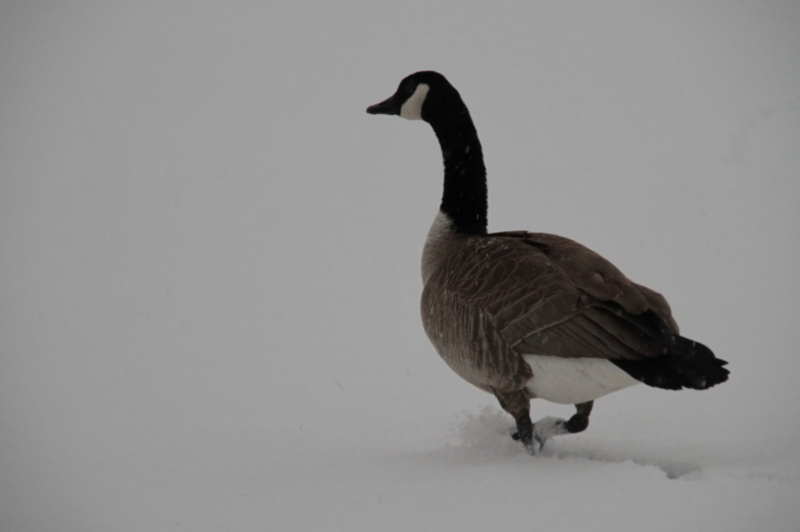 The geese definitely didn’t ask for it to snow, neither for me to show up, adding to their discomfort. They took it in their stride. As the following pictures depict, they even found some enjoyment in the sudden change of circumstances. But activate your new plan. 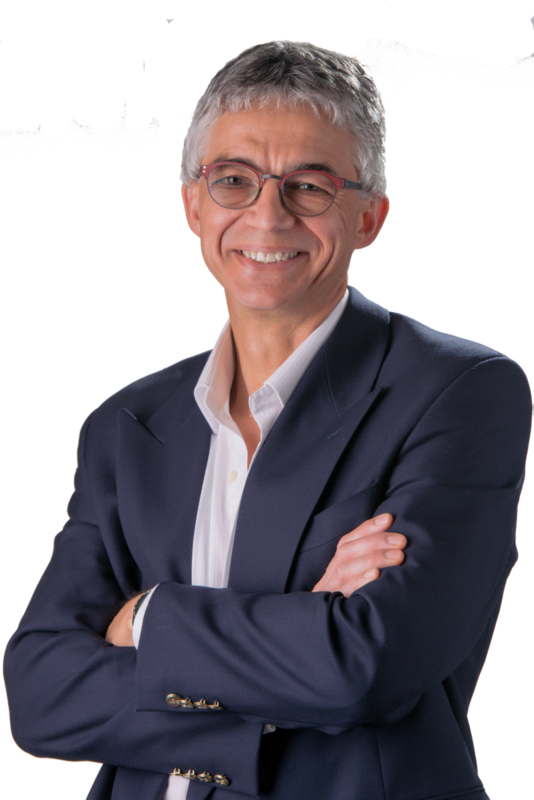 Activate your better and different plan. Mihaly Csikszentmihalyi calls it FLOW. This ability to find sources of strength under extreme adversity. A skill that can be perfected through training and discipline. Individuals learn to analyze their surroundings objectively, discovering new opportunities for action, enabling them to survive harrowing circumstances. I was convinced the gander looked at me with a touch of disdain, if not contempt. He must have wondered why I totally lacked empathy. Then, as I followed them into the clearing, beyond the path and the trees, he literally took a belly-flop in the snow, reminding me of a child with a toboggan, and shoved his beak deep into the soft powder. And no, another door does not open automatically! And this circles back to # 1: don’t neglect your relationships! 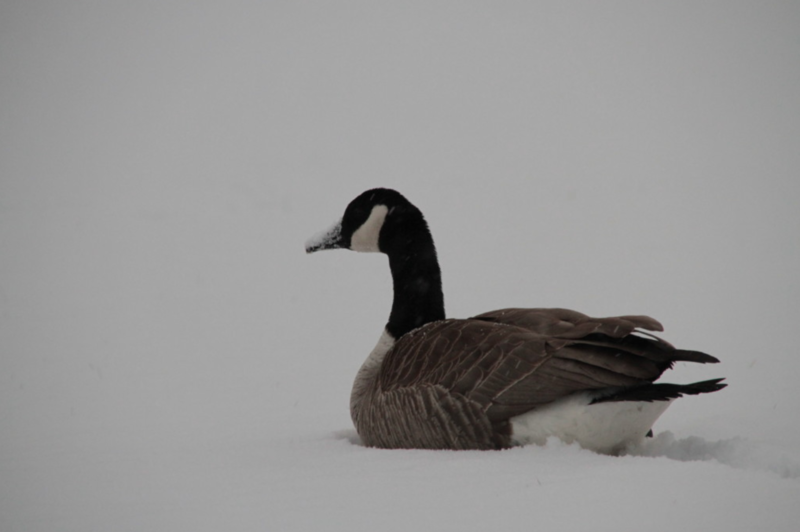 As I watched the geese frolicking in the snow, my own gloomy feelings about yet another snowfall and a driveway that had to be shoveled disappeared. I felt a little ashamed. The geese didn’t make a sound as they moved about in the powder. It had become quiet, the din of traffic had faded. I could hear the actual flakes sifting down on my cap and shoulders. So often do we get dragged down by what life deals us. When real hardships hit home: serious illness, financial hardship, loss of a friendship, loss of a loved one, or the break-up of a relationship we can lose our footing. It can become overwhelming. Hope can be found again. The sun sets and rises. Again. Giving us a new day. Filled with endless (new) possibilities. It is possible to rediscover the beauty in people. Look. Around. You. There’s beauty to be found. But you have to open your mind! If you enjoyed this piece, please comment in the section below and feel free to share. I love feedback! 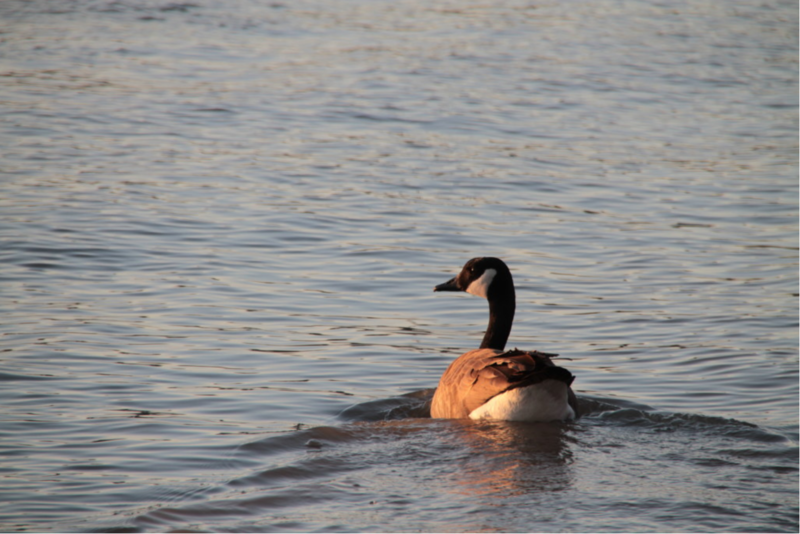 Do Canada geese mate for life? The hidden life of ducks and geese.